Aggressive chemotherapy for a dying cancer patient with days to live. Dumping the truth on a patient overwhelmed and alone. Following the treatment wishes of a family that which are incongruent with the patient who can’t speak for themselves. Prolonging dying because a family says they are waiting for a miracle. It’s not the same as the stress we feel day to day about our work as palliative care clinicians. This feels different; it gets under our skin, and stays with us. What do we do with these feelings? How do we recover when our souls have been tattered? How do we suffocate the intense desire to “change the system”? How do we do this and remain present and authentic to our patients and families looking at their situation? I scream in my head: Why is the family not letting him die peacefully? Why is the team pushing him out the door, don’t they know he’s dying? It’s a useless exercise, but it helps alleviate (momentarily!) my anxiety when dealing with these complicated, unanswerable questions. 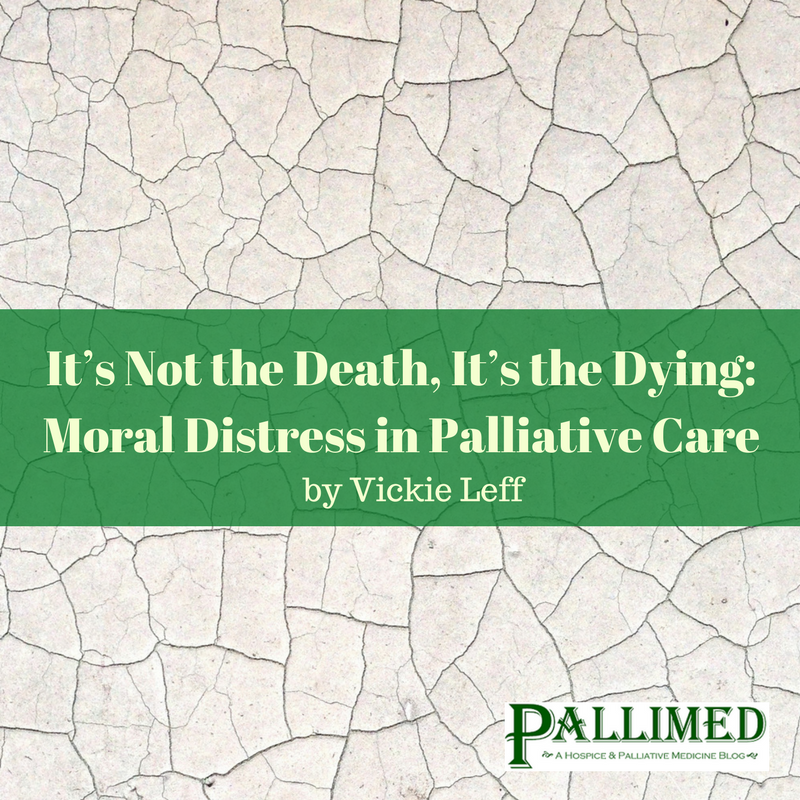 As palliative care clinicians, we calmly address these issues, advocating for our patients, hoping our perspective and expertise may provide some alternatives. Many times, we are successful in changing the conversation; sometimes we are not. And then there are the cases when we become as entangled as everyone else, and it seems like a failure. I often feel selfishly relieved when a patient dies, because the angst has ended. Moral distress is worse for those of us who do not have as much power as others, especially among nurses1. This makes sense; doctors can more effectively change treatment, write orders, and direct care. I spend a good deal of time speaking with bedside nurses and other colleagues about their distress over plans of care, and their frustrations with the surgeon who won’t consult palliative care because they don’t want to “give up.” Most of all, I listen every day to the struggles they have related to feeling powerless in extraordinary situations. 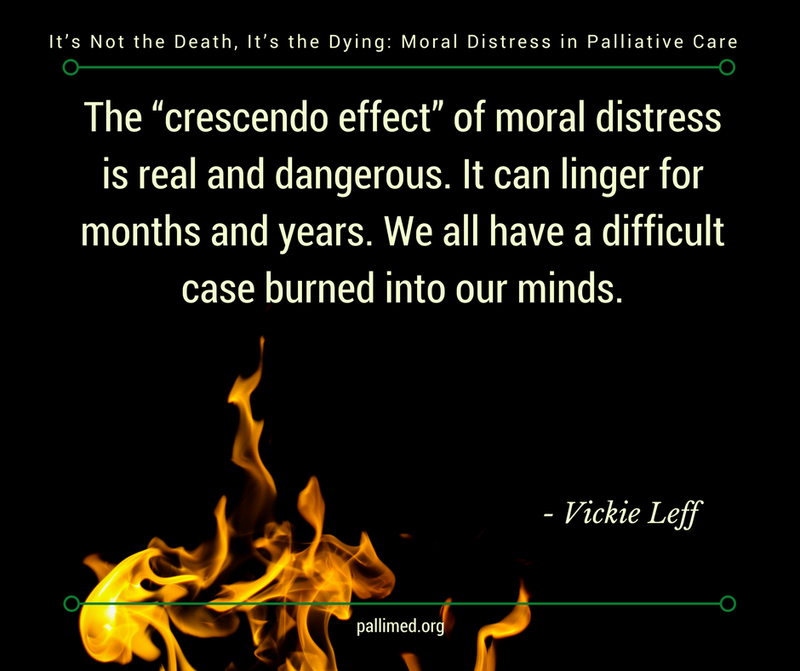 The “crescendo effect” of moral distress is real and dangerous. It can linger for months and years. We all have a difficult case burned into our minds. 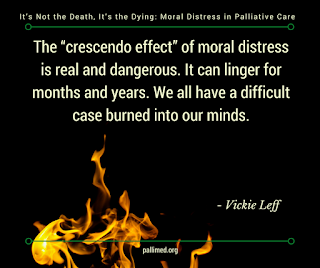 The result of moral distress, especially if we are exposed to it frequently, causes emotional exhaustion, unrealistic expectations, close-mindedness, and boundary blurring between the suffering of the patient and the family and our own 2. As a clinical social worker, I was trained on how to practice self-awareness, or how our issues, reactions, emotions are triggered by therapeutic encounters; and how these impact our work with patients and families. It’s not as easy as it sounds; this takes deliberate practice and natural curiosity. And even then, we are not immune from moral distress. Self-awareness is probably the one skill we can learn that can build moral resilience and help us remain emotionally available to our pts/families and colleagues. We can choose to sweep it aside, become immune and/or cynical or we can take time to examine moral distress and work toward solutions. Identify it early on. Speak about it directly with each other and our colleagues not as failure or barrier but as an opportunity. Only then can we untangle our opinions, and the emotions that keep us frustrated and sometimes frozen. We can also focus on resilience. 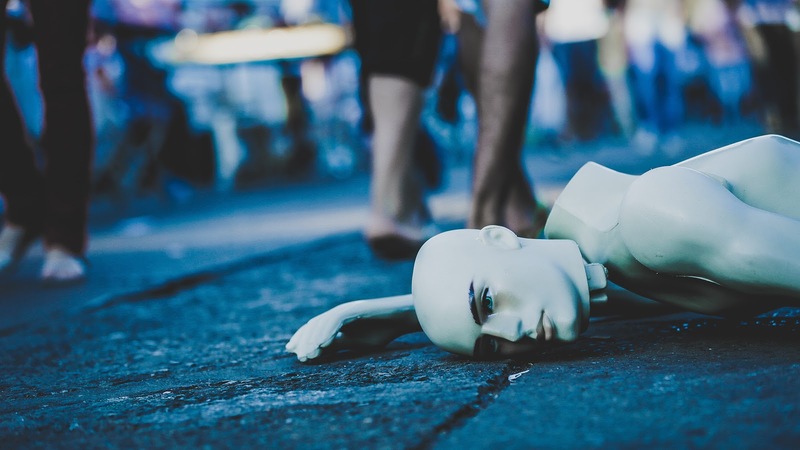 While many resilience strategies are solo in practice, the more social strategies can help us most with moral distress. Informal social support, debriefings3. (See also the Pallimed article, "The Clinical Social Worker Role in Interprofessional Practice"), roundtables, case discussions, Schwartz rounds can all give voice to this distress. Learning from each other, decreasing the isolation that comes with stress, and finding creative solutions to unsolvable problems can give us the glimmer of hope we need to continue and even feel refreshed. Challenging ourselves to see the other side of an argument or plan, remaining open minded, avoiding catastrophizing, and remaining curious (along with regularly scheduled vacations!) can ensure we continue to find meaning and occasional joy in this emotionally difficult work. We should expect moral distress; it is part of our work. We can welcome it into our daily discussions as a way of understanding our patients, families, and ourselves. 1 Whitehead, P. “Moral Distress Among healthcare professionals: Report of an Institution-Wide Survey”. 2014. J. of Nursing Scholarship. 47:2. 2 Epstein, E., Hamric, A. “Moral Distress, Moral Residue, and the Crescendo Effect”. 2009 J. Clin. Ethics. 20(4). 3 Leff, V. “A Successful Debrief Program for House Staff. J. of SW in EOL & Pall Care. 2017 1552-4256. 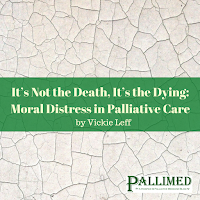 Vickie Leff, LCSW, BCD is the clinical social worker for Palliative Care at Duke University Hospital. She uses running and humor (not always at the same time!) as her primary coping mechanisms.